A massive cluster of yellowish galaxies is seemingly caught in a spider's web of eerily distorted background galaxies in the left-hand image, taken with the Advanced Camera for Surveys (ACS) aboard NASA/ESA Hubble Space Telescope. One galaxy is so far away, however, it does not show up in the visible-light image taken with ACS (top, right), because its light is stretched to invisible infrared wavelengths by the Universe's expansion. 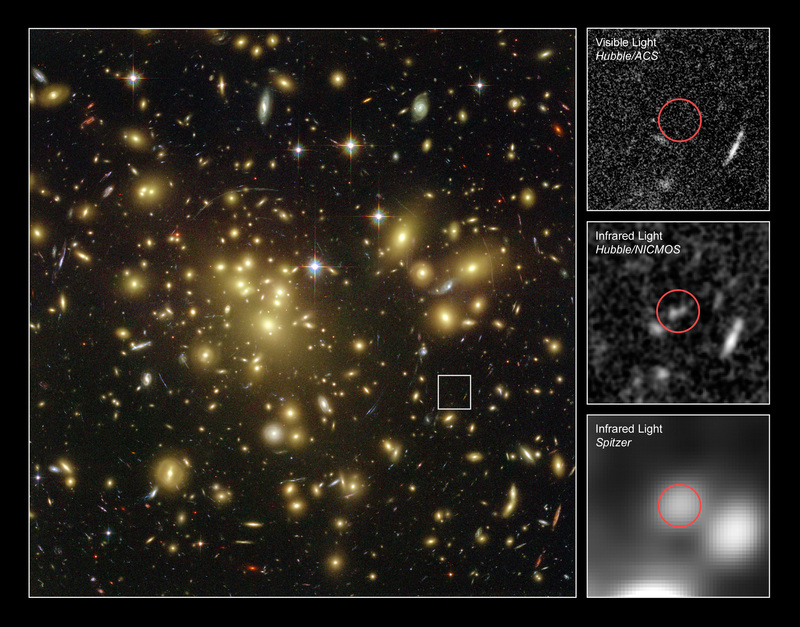 Astronomers used Hubble's Near Infrared Camera and Multi-Object Spectrometer (NICMOS) and NASA's Spitzer Space Telescope with its Infrared Array Camera (IRAC) - with help from the gravitational lensing cluster - to see the faraway galaxy. The distant galaxy, dubbed A1689-zD1, appears as a greyish-white smudge in the close-up view taken with Hubble's NICMOS (centre, right), and as a whitish blob in the Spitzer IRAC close-up view (bottom, right). The galaxy is brimming with star birth. Hubble and Spitzer worked together to show that it is one of the youngest galaxies ever discovered. Astronomers estimate that the galaxy is 13 billion light-years away. Abell 1689 is 2.2 billion light-years away. A1689-zD1 was born during the middle of the "dark ages", a period in the early universe when the first stars and galaxies were just beginning to burst to life. The dark ages lasted from about 400,000 to roughly a billion years after the Big Bang. Astronomers think that A1689-zD1 was one of the galaxies that helped end the dark ages. The ACS images were taken in 2002, the NICMOS images in 2005 and 2007, and the Spitzer IRAC images in 2006. Notes: The grayscale images were captured by, from top to bottom, Hubble's ACS and NICMOS instruments and Spitzer's IRAC instrument.